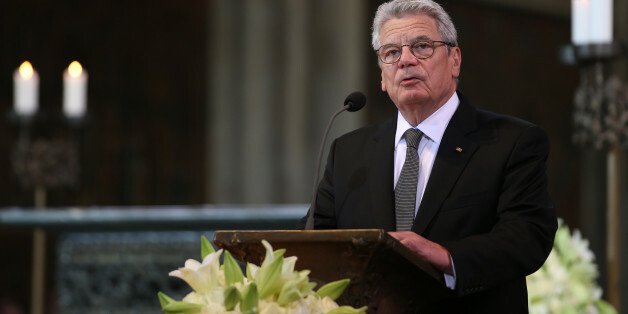 BERLIN, April 23 (Reuters) - German President Joachim Gauck on Thursday condemned the massacre of 1.5 million Armenians by Ottoman Turkish forces a century ago as "genocide," a term that the Berlin government had long rejected. Gauck used the word in a speech to mark the 100th anniversary of what most Western scholars and two dozen governments regard as a genocide against an Armenian population that flourished in what is now modern Turkey. Turkey vehemently denies the charge. Gauck, a former East German pastor with a penchant for defying convention, also suggested Germany itself might bear some of the blame because of its actions during World War One. "In this case, we Germans must still come to terms with the past, as to whether there is in fact a shared responsibility, possibly even complicity, in the genocide of the Armenians," said Gauck, adding that German armed forces were involved in planning and even implementing deportations. His determination to use the controversial word prompted members of parliament to overcome long-held resistance from Chancellor Angela Merkel's government, which until Monday had steadfastly refused to use the term. In his speech, Gauck quoted a phrase from a resolution which lawmakers will debate in parliament on Friday and are expected to endorse overwhelmingly: "The fate of the Armenians is exemplary for the history of mass destructions, ethnic cleansings, expulsions and, yes, the genocides during the 20th century. The term 'genocide' has special resonance for Germany, which has worked hard to come to terms with its responsibility for the murder of 6 million Jews in the Holocaust. Analysts say it was previously reluctant to apply the description in the case of Turkey for fear of upsetting Ankara and the 3.5 million people in Germany who are Turkish nationals or of Turkish origin. There are also concerns in Germany that massacres committed in 1904 and 1905 by German troops in what is now Namibia could also be designated genocide, leading to reparation demands. The reversal of Germany's stance is significant because it is Turkey's top trading partner in the European Union. France, the European Parliament and Pope Francis are among others who have used the term, condemned by Turkish President Tayyip Erdogan. Turkey denies that the killings, at a time when Ottoman troops were fighting Russian forces, constituted genocide. It says there was no organized campaign to wipe out Armenians and no evidence of any such orders from the Ottoman authorities. "Questioning these claims is not up to parliaments or politicians, but rather to historians," Erdogan said on Thursday, before Gauck's speech. "The Armenian diaspora should ask the 40,000 Armenians who are citizens of our country whether they face any persecution," he told a peace conference in Istanbul, organized as part of the centenary of the Gallipoli campaign during World War One.